Made famous by Harris Ranch in California, these pecan drop cookies are like a delicious mix of pie filling and cookie. Plus they're gluten and dairy-free! 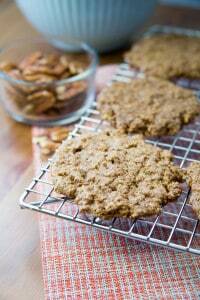 Pecan Drop Cookies are always a HUGE hit – they taste just like pecan pie filling! Harris Ranch is a steakhouse and hotel that appears like a mirage in the middle of a bunch of agriculture land on the West Coast’s Highway 5. 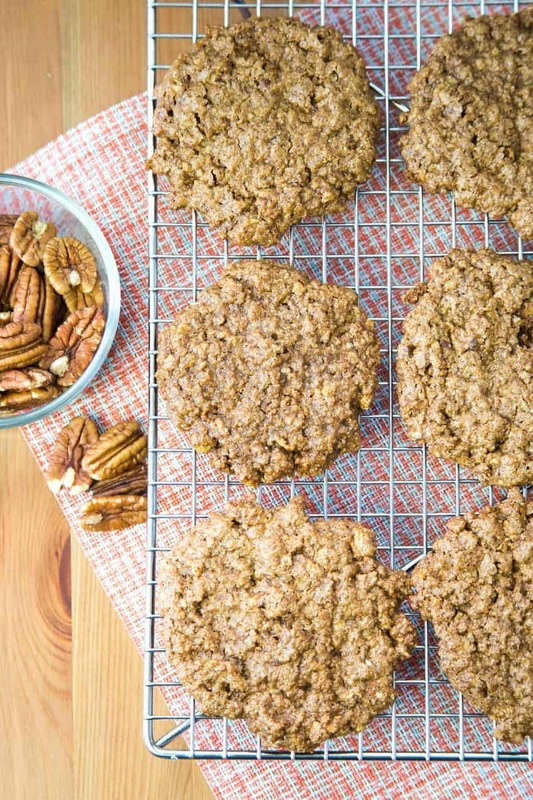 Those in the know settle in for a steak and then make a beeline to the bakery for Pecan Drop Cookies. Here’s my version, which is a hybrid of pecan pie filling and cookie. Be sure not to skip the cooling step – it’s hard to wait, but the cookies will crumble without it. These pecan drop cookies are gluten-free (obviously) and naturally dairy-free too, so this is a great option if you’re dealing with some GFDF folks. 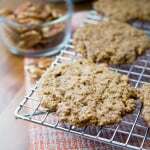 But really, this is one of those recipes where the missing allergens don’t matter – everyone asks for them because the are crunchy, chewy, sweet and addictive. I love the added flavor + fragrance that vanilla bean paste provides, but you could sub in vanilla extract if you prefer (or that’s what you have!) If you like these cookies, you’ll love my 3-Ingredient Macadamia Cookies too. In the bowl of an electric mixer, combine the brown sugar, salt, vanilla and pecan pieces. Beat on low speed to incorporate the ingredients, then drizzle in the egg whites. Increase the speed to medium-low and beat for 4 to 5 minutes, scraping down the sides of the bowl as needed. Drop the dough in rounded tablespoons onto a greased baking sheet. Press each ball of dough with the back of a spoon to form a cookie 3 1/2 inches in diameter and about 1/4 inch thick. Bake 10 to 12 minutes, until the edges are lightly browned. Remove from oven and cool for 3-5 minutes on the baking sheet, then use a thin spatula coated with pan spray to remove the cookies to a cooling rack. The cookies will be soft but will firm up as they cool. The warm cookies can be sticky, so you may need to wipe your spatula as you’re moving them to cool. This entry was posted in Baked Goods, Dairy Free, Desserts, Recipes and tagged cookies, dairy free, dessert, G-Free Foodie, gluten free, gluten free holiday, kc cornwell. Bookmark the permalink.